New Physiotherapist to add to the team! We are expanding as our patient numbers grow at all our clinics. 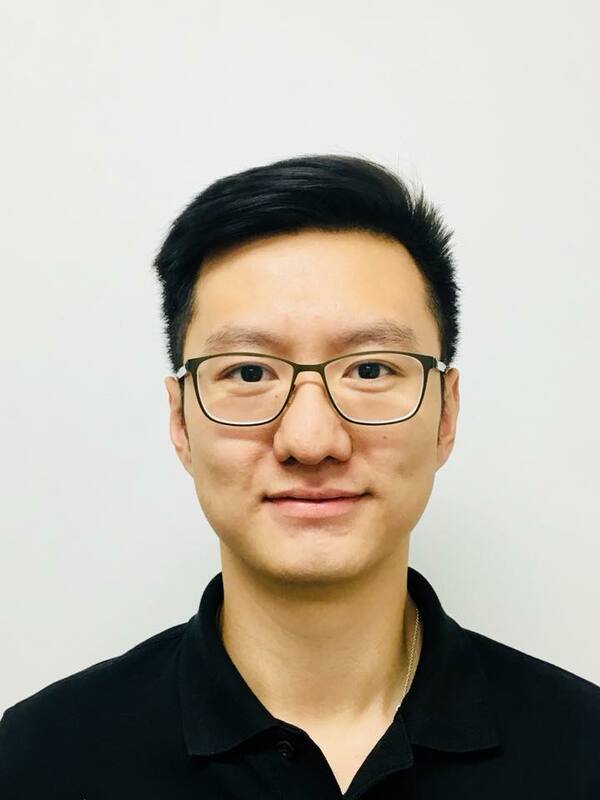 Matthew (Pak Him) Chow has just started working at our Dandenong (Dandenong West Medical Centre) and Narre Warren (Pound Road Medical Centre) branch. Matthew graduated from a Doctor of Physiotherapy at University of Melbourne and he is passionate about improving clients' level of function and achieving their goals through the use of evidence-based physiotherapy. He has had experience working in hospitals in the areas of musculoskeletal, cardiorespiratory and neurological rehabilitation. Matthew's particular interests include sports physiotherapy, clinical pilates and injury preventions. Outside of work, he enjoys having a few hits on the squash court and exploring the food culture of Melbourne! He is also fluent in both Cantonese and Mandarin. We welcome Matthew to the team! It’s difficult to think about exercise whilst you’re sitting on an icepack after an episiotomy. But I knew I had to get moving after a few days so I started walking up and down the maternity ward twice a day. At home I started hobbling down to the corner (a miserable 20m) and back twice a day then gradually increased as I felt better and less sore. 12 weeks later and I've returned to my pump and cardio classes at the gym and my body is feeling normal with some additional jiggly bits. Be guided by your healthcare professional but general guidelines are as follows. Gentle stretches – Some muscles were getting tight from breastfeeding, carrying my little one and spending too much time in our confined room. So I started stretching regularly my neck muscles, shoulders, plus lower limb muscles. Walking - Pick up the pace and distance as able. Swimming - Once your stitches and bits and bobs have healed fully and bleeding has stopped. Gentle low impact exercise - For example Pilates and Yoga. Keep in mind that your ligaments and joints are more pliable and at risk of overstretching. Light upper limb weights - You’ll be spending your days carrying your little one which mainly uses your biceps so build your other arm muscles to balance it out. Stretching – add back stretches to your neck, upper and lower limb stretches. Get down onto the floor and do some back stretches whilst your little one does their tummy time. Low impact aerobics – let’s not stress out that poor weak pelvic floor with star jumps yet. Back to your pre-pregnancy exercise whether it is brisk walks, weight training, gym classes or jogging. Please give yourself plenty of time to heal (physically and mentally), particularly if you have had a complicated pregnancy or labour. 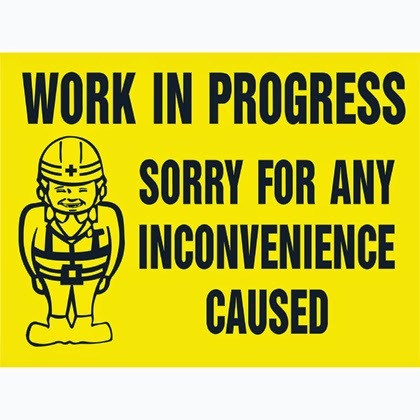 If you feel any discomfort or are unsure please consult your doctor/midwife/maternal health nurse/physiotherapist. Aim for a gradual return to exercise and don’t place too much pressure on yourself. I like to exercise because it gets me out of the house for some ‘me’ time, boosts my energy and keeps me sane. You’ve just gone through a tough 9 months growing a human and this is the time to enjoy being a mum! Exercises for your newborn baby! Newborns enter the world all curled up and soft with very little muscle strength and flexibility. As adorable as this stage is, it is vital for the development of strength, posture, balance, muscle tone, coordination and skull bone formation that babies have ample freedom of movement and opportunities for play. Experts find that babies that don’t spend enough waking time on their tummies can have some delays in their development of motor skills. Tummy time gives your baby the opportunity to strengthen the muscles they need to prepare them for rolling, sitting up, crawling and pulling to stand. Daily tummy time and side lying when your baby is awake is important to prevent ‘Flat Head Syndrome’ plus provide valuable developmental benefits for your baby's motor, cognitive and sensory development. Aim for 1-5 minute bursts for newborns then increase as able. Pick a time where they’re awake, content, not hungry or tired. 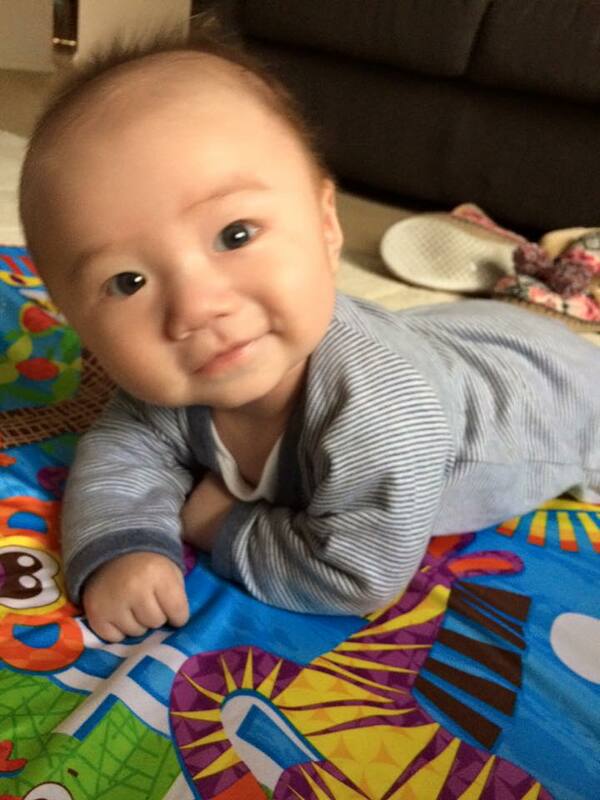 Put your little one at table height, get down onto a floor playmat or place your baby on your chest. Encourage your baby, talk to them, sing to them, make funny faces etc. Use toys, rattles, mirrors and other interesting items to keep them interested. Stop when your baby seems unsettled or uncomfortable. Rachel Coley is a pediatric Occupational Therapist whose website www.candokiddo.com is full of information about your baby's development. She covers topics such as; developmental milestones, playing with your baby, tummy time and avoiding a flat head (positional plagiocephaly). Lower and upper back pain occurs in 60-70% of pregnancies. We always encourage patients to start an exercise program well before they are pregnant as prevention is the key! That said, it’s never too late to start with some gentle exercises for all women who are pregnant without complications. Why is the spine vulnerable during pregnancy? 1) Cardiovascular exercise - Any activity that increases the body's heart rate for a sustained period of time is considered cardiovascular exercise. Walking, biking, low impact aerobics and swimming are all considered safe for most pregnant women and can be performed for 20 to 45 minutes, 3 to 5 days a week. Pregnant women should take care to exercise at a mild to moderate level, but not to the point of exhaustion or overheating. 2) Strengthening exercise - Strengthening the abdominal muscles, back muscles, pelvic floor, buttock, and thigh muscles can effectively help prevent and decrease back pain. It is recommended that the strengthening exercises be performed in a slow and controlled manner. This includes light hand weights, pilates and exercises such as squats, lunges, bridging etc. 3) Stretches - Although there are many stretches that can safely be performed during pregnancy, the muscles that most often contribute to back pain are the hamstrings, hip flexors, gluteals and erector spinae muscles. A physiotherapist can devise a specialised exercise program tailored to your needs and the stage of your pregnancy. We can also provide soft tissue massage, spinal mobilisation, postural taping, posture education and pregnancy support prescription to help with pain relief. Construction of the new medical centre in vermont south where we're opening our 3rd branch has been delayed unfortunately. Looks like we'll be opening nearer to the end of 2015. In the meantime, we're still working hard in Narre Warren Sth and Bayswater Nth. 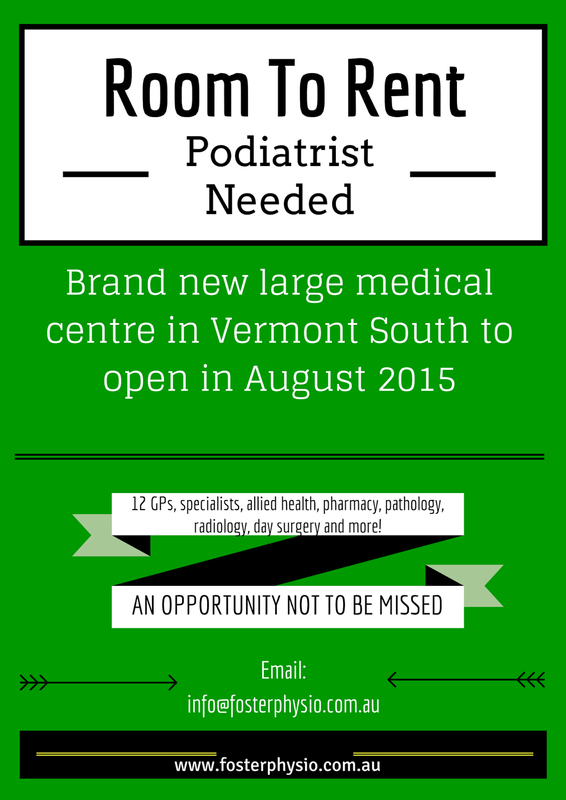 Foster Physio is expanding and in 2015 we will open up our 3rd branch in a brand new medical centre. We have a consulting room to rent for 1-2 sessions a week for an experienced podiatrist. Striving for excellence in the diagnosis and treatment of musculoskeletal dysfunction. We have a reputation for expertise in musculoskeletal, sports and spine injuries. Giving personalised care to help you return to sport, work & play. We are currently in two locations in Narre Warren and North Bayswater.